Applications should be submitted on behalf of a team of collaborating representatives from at least three countries that are member and/or observer of CLARIN (see overview of consortia). The material of the recent CLARIN-PLUS workshop on digital newspaper collections is now available - including video recordings of all presentations. An excellent opportunity to catch up with the state of affairs if you were not able to attend! CLARIN is setting up a pool of software testers, with the aim to establish a group of people that can occasionally carry out various kinds of testing tasks for CLARIN core services, tools and web pages. If you are interested in joining this pool, you can now join by filling in the online form. To be able to properly match testing tasks and potential testers, we are using this form to collect some information from the pool members with respect to experience, preferences and testing abilities such as available device types. To be clear, submitting the form will not result in any obligations from your side, but we may contact you and ask if you are willing to perform one or more testing tasks depending on your profile based on the information that you provided. Please do keep in mind that the testers pool is still in its pilot phase, so we may require additional information at a later stage and at this stage we cannot predict how often there will be testing tasks and what their exact nature will be. If you have any questions or remarks about the form, the software testing pool or any related matters, don't hesitate to send them to testing@clarin.eu. Around the last CLARIN Annual Conference last month, there have been changes in the chairing of two CLARIN Committees. In the CLARIN Legal Issues Committee, Aleksei Kelli, University of Tartu, Estonia, has taken over the chair position from Krister Lindén, who is now focussing on his position as National Coordinator of the Finnish CLARIN consortium. Penny Labropoulo, Athena RC/ILSP Athens, Greece, is vice chair of the CLARIN Legal Issues Committee, taking over from Eric Ketzan. CLARIN in general and in particular the Legal Issues Committee thank Krister Lindén and Eric Ketzan for their excellent work in the last years, and are looking forward to continue and even intensify the collaboration under its new chairs. Also the CLARIN Standards Committee has had a change of chairs. After many years of serving as chair, Andreas Witt has now stepped back and handed over to Piotr Bański, IDS Mannheim, Germany. Karlheinz Mörth, ICLTT, Vienna, however, has agreed to continue as vice chair. Again, the whole CLARIN community and in particular the Standards Committee thank Andreas Witt very much for his work as chair, and welcome Piotr Bański in his new role and hope for good collaboration within and with the Standards Committee. On 10 and 11 November, CLARIN.SI hosted a CLARIN ERIC development workshop at the Jožef Stefan Institute in Ljubljana, Slovenia. The workshop, organized by Tomaž Erjavec, Darja Fišer, Nikola Ljubešić (Jožef Stefan Institute; CLARIN.SI), Erhard Hinrichs (Eberhard-Karls-Universität Tübingen; CLARIN-DE) and Inguna Skadiņa (University of Latvia; CLARIN-Latvia), brought together 14 participants from 6 national CLARIN consortia, also including the Czech Republic, Estonia and Italy. Participants presented their existing annotation tools and those in development (covering a total of 9 different European languages) and discussed how their tools could be made more accessible to researchers in the humanities by incorporating them into the user-friendly WebLicht platform for corpus annotation workflow development and execution environment. Most importantly, a plan for a three-month development project was drafted. 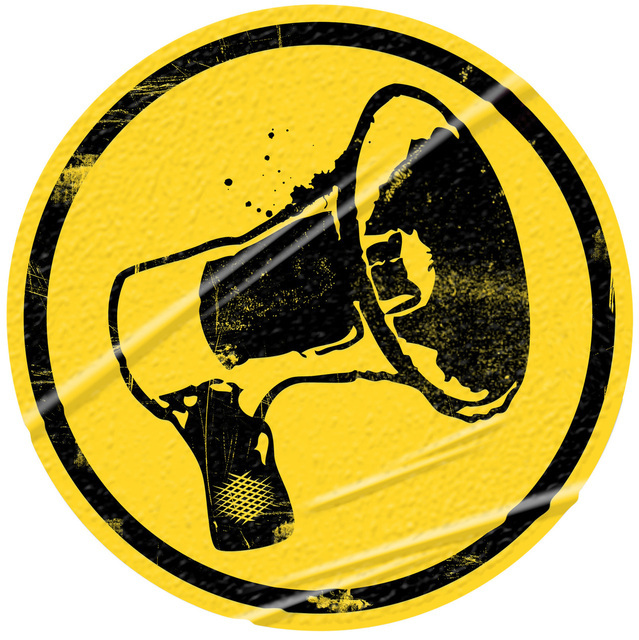 If accepted, the project will encompass the integration of the selected annotation tools into WebLicht, the development of a novel web service for word nominalization, enabling a more efficient treatment of non-standard texts (such as those found on social media) and, last but not least, user evaluation of WebLicht and the related annotation tools. Visit the workshop webpage for further information, such as the workshop’s programme and the list of the attendees. At a national seminar about research data held in Oslo on November 14-15, 2016, CLARINO was presented by Koenraad De Smedt. 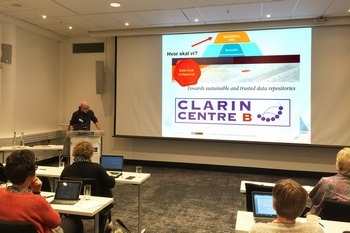 At the same event, TROLLING - The Tromsø Repository of Language and Linguistics announced its intention to seek certification as a CLARIN Type B centre (see picture). The Talk of Europe - Linked Open Data of debates of the EU Parliament is now officially deposited at DANS. The Talk of Europe – Travelling CLARIN Campus (ToE-TCC) - project has curated the proceedings of the European Parliament (EP) from 1999 onwards, including all available translations in other EU languages, and converted these to RDF. Moreover, the data are enriched with biographical and political information on the speakers. Since the data are available in multilingual form, this dataset lends itself to be linked with resources in other European countries, such as parliamentary records or news reports. Lärka - “LÄR språket via KorpusAnalys” - with its English equivalent “Lark” (Language Acquisition Reusing Korp) is the ICALL platform of Språkbanken (the Swedish Language Bank). ICALL – Intelligent Computer-Assisted Language Learning – has as its main aim to draw on the opportunities offered by language resources, such as corpora, lexicons and natural language processing (NLP) components including lemmatizers, parsers, etc., to build more sophisticated and flexible applications for language learners and students of grammatical theory. The work on Lärka started in the project ‘Systems Architecture for ICALL’ financed by NordPlus Sprog from2011 to 2013. Specified as a modular web-based exercise generator that reuses available annotated corpora and lexical resources, Lärka is freely available, targeting primarily learners of Swedish as a second/foreign language and students of Swedish linguistics. Being web-based, Lärka has advantages of accessibility and ease of use. Lärka is designed as a Service Oriented Architecture based on web services. The platform comprises two main components – user interface and web services – where the web services can be reused by other applications. Web services take care of exercise generation whereas the user interface collects user input, formats the web service output, and assigns behavior to buttons and menus. Mietta Lennes (FIN-CLARIN) presents Kielipankki - The Language Bank of Finland. You are invited to participate in the "CLARIN Workshop (type I) -- Towards Interoperability of Lexico-Semantic Resources", that will take place at the Center of Estonian Language Resources (CELR) in Tartu, Estonia. The goal of the workshop is to improve the interoperability, usability and ease of access of CLARIN lexico-semantic resources. To achieve this goal, we will work on the design of CLARIN open virtual lexical platform facilitating better access to lexical resources and research web applications by users in the humanities and social sciences users. The workshop will feature discussions and group work, and most of the time is reserved for chaired discussions in small topic-related subgroups, concluding with reports presented to the general forum by the chairs during the summing-up session. The description should be approximately 500 words. The deadline for submission is 5 December 2016. Challenges and Practices of Copyright and Licensing of Digital Cultural Heritage are the main topics of this event organized by the CO:OP project, funded by the Creative Europe programme of the European Union aims to strengthen and promote the co-operation between institutions preserving our common cultural heritage and the general public. The new biennial conference series on Language, Data and Knowledge (LDK) aims at bringing together researchers from across disciplines concerned with the acquisition, curation and use of language data in the context of data science and knowledge-based applications. Firstly, language data of all forms, including linguistic and semantic annotation of lexical, terminological and ontological resources and their acquisition, representation and maintenance. Secondly, knowledge graphs and their applications including knowledge extraction, entity linking, ontology learning and Linked Data. A further focus, is the application of these techniques to industry, biomedicine, humanities and social sciences. 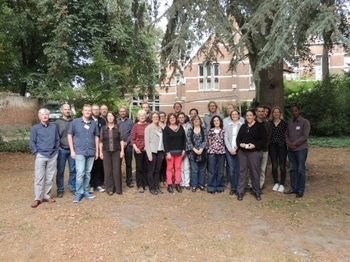 The LDK conference has been initiated by a consortium of researchers from the Insight Centre for Data Analytics, InfAI (University Leipzig) and Wolfgang Goethe University and a Scientific Committee of leading researchers in Natural Language Processing, Linked Data and Semantic Web, Language Resources and Digital Humanities. LDK is endorsed by several international organisations: DBpedia, ACL SIGANN, Global Wordnet Association, CLARIN, and Big Data Value Association (BDVA). The first conference, LDK 2017, will be held in Galway (Ireland). The DHBenelux conference is an initiative that aims to disseminate digital humanities projects in Belgium, the Netherlands and Luxemburg, and foster collaboration between them. The conference serves as a platform for DH researchers and offers an opportunity for members of the DH community to meet, present research, demonstrate tools, and discuss projects. The fourth DHBenelux conference will be hosted by Utrecht University and is open to everyone, including researchers from outside the Benelux. The call for proposals is open. The deadline for submitting abstracts is 15 February 2017, 23:59 CET. McGill University’s Faculty of Arts invites applications for a tenure-track position at the rank of Assistant Professor with a primary area of specialization in the field of cultural analytics and digital humanities. Candidates may be working in a variety of subfields across the humanities and social sciences, including literature, history, anthropology, music, photography, art history, cinema, linguistics, information studies, and cultural or media studies, and must have a demonstrable research program that uses computational analysis for the study of culture. The Max Planck Institute for Psycholinguistics (part of the German Max Planck Society) is looking for a Java developer to strengthen its technical support group. The research that takes place at the institute has as its goal to understand how our minds and brains process language, how language interacts with other aspects of mind, and how we can learn languages of quite different types. The technical group of the MPI is responsible for supporting this research in various ways, ranging from normal IT infrastructure to specialized experiment setups and labs, as well as software development. The successful candidate will be responsible for developing and maintaining Java-based applications, mainly for the web, as well as for the deployment of these applications throughout the development cycle (development, testing, staging, production). An important part of the work will be related to the MPI's new research data archiving solution, which is being built on top of the widely used Fedora Commons repository framework.